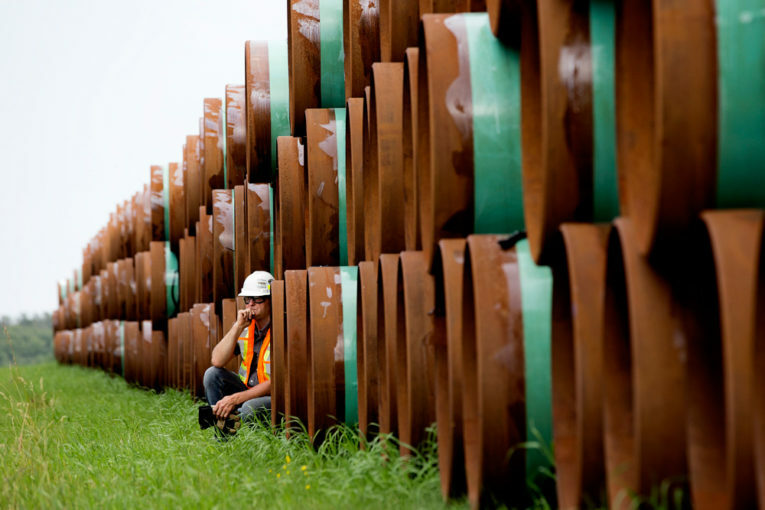 CALGARY – Canada’s main pipeline export system is full and will remain full even if owner Enbridge Inc. succeeds in completing its Line 3 project, which is currently awaiting approval in Minnesota. Enbridge president and CEO Al Monaco said during an earnings call Friday that the company’s mainline system delivered a record-setting amount of crude from Alberta to refineries in the U.S. Midwest in December and the system would be full for at least the next three years. “In December the combination of growing (Western Canadian) supply and strong refinery demand drove record deliveries of 2.733 million barrels per day which is close to maximum capacity,” Monaco said of his company’s mainline, the biggest export pipeline system for Canadian oil. “January and February volumes look pretty strong as well and we expect the system will essentially be full for the rest of the year. In fact, we expect that to be the case through 2020, including our Line 3 given growing supply and lack of other pipeline capacity before them,” Monaco said. Line 3, approved by Prime Minister Justin Trudeau in 2016, is a replacement project for an existing pipeline route and would roughly double the capacity of the stretch to 760,000 barrels per day at an anticipated cost of $7.5 billion. Enbridge expects regulators in Minnesota to make a decision on the line in the second quarter of this year and expects the line will be shipping oil between Alberta and Wisconsin in 2019. Monaco’s statement that his company’s pipelines would remain full until 2020 were aimed at long-term concerns for Enbridge’s mainline, and whether utilization would slip if competing pipeline projects are built. Those competing projects include TransCanada Corp.’s Keystone XL or Kinder Morgan Canada’s Trans Mountain expansion – also mired in ongoing regulatory challenges in Nebraska and British Columbia, respectively. He said that even if competing pipelines are built, Canadian heavy oil producers generally receive $5 more per barrel of oil at the refineries connected to Enbridge’s mainline than elsewhere. As a result, Monaco said, he expects oil producers in Calgary will continue to demand space on the mainline. While the company’s mainline is expected to remain full over the coming years, the company earned less money from its liquids pipeline business than RBC Dominion Securities analyst Robert Kwan expected in the quarter. In a research note, Kwan noted that he expected Enbridge’s liquids pipeline business would earn $1.54 billion in the fourth quarter but it only pulled in $1.48 billion, and the company’s overall earnings were lower than expected. Enbridge’s earnings were down 43 per cent to $207 million in the fourth quarter compared with $365 million for the same period a year earlier, largely as a result of one-time charges. Enbridge shares fell slightly, just under half a per cent, to $43.06 each in mid-day trading following the company’s earnings release and update. Monaco also hinted that Enbridge was weighing the impacts of U.S. tax reform for future capital projects against the recent changes to the regulatory structure in Canada. “We’re going to be very cognizant of where we put capital,” he said. Ottawa unveiled sweeping changes to the way new pipelines are assessed earlier this month. “Generally, we’re supportive of the government’s goal to increase the confidence in the process and we’re thinking that the direction is right,” Monaco said, adding that he was pleased the new framework includes shorter timeframes and also more involvement for First Nations. He said he was concerned that the complexity of the changes — the creation of the Impact Assessment Agency and the revamping of the National Energy Board into the Canadian Energy Regulator — could create more uncertainty in the long run. Enbridge also denied reports saying the company planned to sell as much as $8 billion in assets Friday, more than twice its initial target. The company reiterated its plans to sell $3 billion in assets and also raise $3.5 billion to fund its capital program.